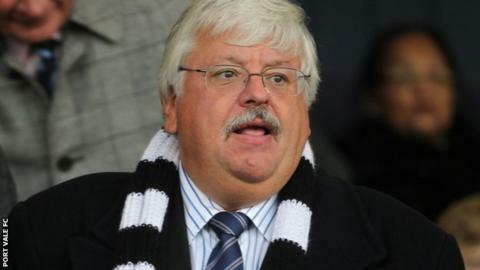 Port Vale chairman Norman Smurthwaite has confirmed to BBC Radio Stoke that he is putting the club up for sale. Smurthwaite, who first became involved with Vale in November 2012, made his decision following Sunday's FA Cup second-round exit at Exeter City. He said the 2-0 defeat had left him "humiliated, ashamed and embarrassed", adding: "Officially from today, the club is up for sale." Vale are 11th in League One, four points from a play-off spot. Missed Norman Smurthwaite's interview with BBC Radio Stoke? Listen again here. Smurthwaite held lengthy talks with manager Rob Page after the loss at League Two side Exeter, also expressing his frustration to fans on supporters' coaches. Page told BBC Radio Stoke after the match that he did not fear for his position as Vale boss. Smurthwaite added: "I just feel I've let the club down because I've tried to do everything myself, which meant cutting costs to put every available penny onto the pitch. "Clearly that must be wrong because yesterday, if the players had put the same amount of effort into playing as I do to finding the way to pay them every month, we'd have knocked that club for six." Asked about his plans to sell Port Vale, Smurthwaite said: "As things stand, it's not a 'distress sale'. The club isn't going to go bust. "Having three years of nurturing this, I'm not going to take the first guy that's got the cheque. They've got to tick a lot of boxes for me." Smurthwaite and former business partner Paul Wildes took Port Vale out of administration in 2012. When Wildes left in May 2013, shortly after Vale had won promotion from League Two, Smurthwaite became chairman and sole owner.